We're so glad that Greg reached out to share his story of strength and positivity. Enjoy - you'll smile just like we did! 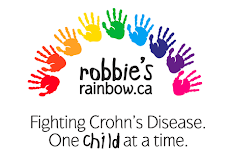 First off, I would like to applaud The Gutsy Generation for all their hard work in raising awareness for IBD and I’d like to congratulate Robbie and the Team for having Robbie’s Rainbow officially registered as a charity, this is such a huge milestone. I would like to share my story with you, those that are newly diagnosed, those that are living and caring for someone who is newly diagnosed and those helping to find a cure. I was diagnosed with Crohn’s Disease at the age of 9, but if you ask my parents, they’ll tell you I’ve been dealing with this disease since the day I was born. I was born in March of 1983 and if you do the math, that means I’m 29 years old, so I’ve been dealing with this disease for almost 3 decades. I’ve learned a LOT of stuff about Crohn’s in this amount of time… actually I learned a lot about Crohn’s before my 15th birthday. I cried for the first 10 months of my life. Well not really cried, according to my mom and dad, I screamed for the first 10 months. Let it be known, that 10 months of screaming resulted in me being an only child and I cannot blame my mom and dad one bit for that. My parents were told I was colic, they knew it was much more than that. From the age of 10 months, up until I was 8 years old, I lived a pretty healthy, active, normal life, but then things started to go downhill. I started making more trips to the washroom, frequent diarrhea, severe cramping and major weight loss. The trips to the family doctor started to become a weekly ritual and soon I was referred to a local specialist to try and figure out what was going on. I remember his name vividly, Doctor Berg, a gastroenterologist here in Sudbury. For those that don’t know, Sudbury is a small community of 165 000 people located approximately 400 kilometers north of Toronto, Ontario. We’re predominantly an underground mining community, keep that in mind, as it will come into play later on in my journey. So back to my story. Doctor Berg sent me for an array of tests, scans, blood work, etc. Eventually he sent me on my way to Sick Kids Hospital to see the experts and figure out what the heck was causing such an illness. This is when I was officially diagnosed with Crohn’s Disease at the age of 9. I’ve been asked many times what went through my head when I was told I have Crohn’s. The first things were, “What the heck is Crohn’s Disease? How do I spell Crohn’s? , And why must they call it a Disease? “. The second round of questions were,“ How is this going to affect me? Will I live a normal life? Where’s the cure? And why am I not healthy like the other kids? “ . Another question I asked, and continue to ask but kind of know the answer to, is “Why does my dad continue to call it Chrome’s Disease?” The answer to that one … it’s his French background. For him, three is tree, tongs is thongs and Crohn’s is Chrome’s. I gave up correcting him many years ago and now I just smile and nod when he talks to family and friends about my “Chrome’s Disease”. So at 9 years old, I was put on a daily dose of medications. I had a weekly pill organizer … breakfast, lunch, dinner, bedtime … Sunday through Saturday ... just what every kid wants. The steroids did their thing. I went from being the skinny kid in class to being the fat kid. I felt great but that’s what steroids are supposed to do, make you feel great and mask the disease. I can’t even begin to name all the medications I was put on … prednisone, 5 ASA, metronidazole, methotrexate, ciprofloxacin , the list goes on and on. I knew this list by the age of 13. From 13 to 16, I had my ups and downs. Going for routine blood work, ultrasounds and the “not-so-new-anymore” Colonoscopy. I was eventually put on another round of steroids shortly after my 17th birthday and it just so turns out, it was around this time I received a letter in the mail telling me I was selected by the Ontario Ministry of Natural Resources to become of their Ontario Ranger Program…. I was going to spend the summer of 2000 with 25 other guys, over 1000 kilometers from home, in the cramped quarters of a bush camp in the small north western Ontario village of Ignace. This was going to be one of my first real jobs (other than pumping gas ) and I was going to spend weeks at a time clearing canoe portages, campsites and performing work in some of Ontario’s Provincial Parks. This also meant I wasn’t going to be near any real washrooms for weeks at a time but that was Okay, the steroids were doing their things and helping to mask the Crohn’s symptoms and I was gaining weight. I made it through that summer feeling great and came home after 12 weeks 40 pounds heavier ,just in time for the new school year and heading into grade 12. Grade 11 was going to be awesome for the first semester. My guidance councilor hooked me up with a semester-long co-op placement at Science North, a nice science center here in Sudbury, and I was going to be on the Biodiversity/Biosphere level of the building which was right up my alley since I planned on going to college to become an MNR Conservation Officer once I graduated highschool. A week into school I started to feel some cramping but shrugged it off as the side effects of me coming off the prednisone… no big deal really, I’ve had cramps before. A week later my life was about to change. It was a nice warm September day and my dad had just picked me up from my co-op placement and we were heading home at 4pm, I had felt under the weather all day. I remember the next chain of events like it was yesterday. Here we were driving along, 10 kilometers from home and the traffic light turns red. We’re stopped at the light and I feel as though someone is sticking a knife into my lower abdomen. The pain is so strong that I’m out of breath… so I take a deep breath and all I feel is a “pop” , kind of like a bubble from a piece of chewing gum had just been burst. I’m stubborn, strong and very quiet. I’ve lived with Crohn’s for 17 years, so I don’t complain about pain and I kept quiet this time also. Dinner was ready when my dad and I got home, I sat at the table to eat but couldn’t stomach more than a bite and had to go lay down on the couch. The vomiting started but I never said a word and just went to lay down in bed for the night. I didn’t get a minute of sleep that night and when morning rolled around my parents knew something was up. I told them I needed to go see a doctor. I told them I could not get out of bed. My dad carried me out to our vehicle and brought me to my specialist who had taken me on months prior when my previous gastroenterologist had moved his practice. My dad carried me into the office where we were rudely told that if I didn’t have an appointment, I wasn’t going to be seen. We then went to the emergency department of the local hospital. “What’s your pain on a scale of 1 to 10?” I was asked. I replied “12”. We were then told it was a 4 hour wait until I could see a doctor. My mom called our family doctor and we were told he was on-call at the local clinic. My dad once again picked me up and carried me to the vehicle and we made the trip across town. The clinic was packed with people but as soon as we walked in, my family doctor spotted me as he walked by. He told his nurse to lay me on an examination bed. He lifted my shirt, placed his hands on my abdomen and no sooner than I could say it hurt, he was calling his nurse to have an ambulance brought in. A lot is a blur from this moment on. I remember getting to the hospital, doing a few tests and the next thing I know I’m being asked to sign forms … I was being prepped for surgery. An I.V line was being put into my arm, the bright lights of an operating room were blinding me and a mask was being put on my face. I was in surgery for 5 hours but it felt like 20 minutes. I had never had surgery up until this point, so what a weird feeling waking up, dazed and not knowing where you are. I was heavily sedated for 3 days, so I don’t remember anything, except asking what time it was. After day three, I finally was conscious enough to know what was going on. My mom and dad were in the room with me and so were a few nurses and the surgeon. The surgeon’s first words, were “ You made it” . I pulled down the sheet to see what kind of scar I had. It was a “zipper” from above my belly button down into my lower abdomen, a good 14 inches in length … oh … and an ostomy bag. Having researched Crohn’s and having spoke to various people over the years, I knew surgery was a typical thing . I also knew that one day having an Ostomy was a possibility. That day had finally arrived. I spent a month in the hospital recovering, missing my co-op and learning about living with an ostomy. I remember the day the ostomy nurse came into the room and explained how to care, clean and change an ostomy appliance. Maybe it was my young age or maybe it was my stubbornness, but I had the changing, caring and cleaning figured out in no time at all. After all, if I didn’t learn it now, I wasn’t going home and I really wanted to get home… the hospital food had gotten the best of me and I was eager to sleep in my own bed. I made it home before Thanksgiving that year, returned to my co-op, finished my last semester, met a girl and graduated from high school. I earned an award for “Most determinate student” that year because of the challenges I faced and for being able to finish with some excellent grades despite missing so much time. As I mentioned I also met a girl. Now this was probably one of the biggest challenges I’ve faced. How do I tell this girl that I have Crohn’s Disease? How do I explain that it’s a bowel disease? And how do I tell her I have an Ostomy? Simple! I came right out and told her and explained it. If she was not going to accept it, than this relationship was not going to work. Much to my surprise she accepted it. She didn’t care that I had scars, she didn’t care that I had Crohn’s disease and she didn’t care that I had an ostomy. She liked me for my personality, for who I was and the Crohn’s that’s just part of the package. We dated for over a year before we went our separate ways. This relationship taught me several different things. It taught me how to be confident in myself. It taught me that there are people out in the world that care about more than just looks, and it taught me that Crohn’s Disease is really no different than someone being diagnosed with any other disease. Between the age of 17 and up until 3 years ago, I spent quite a bit of time in and out of hospitals and having surgeries. But during that time I also met my wife. Oddly enough, we met through another girl I dated for a short period of time, who also happens to be my best friend, who also did not judge me based on appearances. Funny, how in a society that seems to portray model good looks and 6-pack abs as being the thing that ALL women want, there are so many girls in the world that don’t actually care for that kind of thing and want someone who is just “normal”. The same can be said for how many guys in the world that don’t care to have the magazine cover super-model. When I first met my wife, I explained to her that I had Crohn’s, that I had an ostomy, and that more than likely I’d spend some time in and out of hospitals. We’ve been together for 8 years now and have been married for 2. We also have a beautiful 7 month old, healthy little girl. My wife has stuck by my side through thick and thin. She’s been there through doctor’s appointments, through surgeries, through days of laying in bed feeling like crap, and through days when I’ve asked “Why did I end up with this disease?. She usually replies that I ended up with it because someone else probably wouldn’t have the strength to deal with it. She has also been there with me through some major accomplishments. I never did go on to college to become a Conservation Officer. I went to college for Civil Engineering, which I figured out in my third semester just wasn’t for me. I’m from a mining town, my dad was a miner and my grandfather was a miner, so naturally I got into mining. Unlike my father and grandfather, I didn’t want to be handling a 120 pound rock drill for 12 hours per day, so I enrolled myself in one of the best mining schools in the world located here in Ontario and studied Mining Engineering. I graduated with Honors a couple of years ago and have been employed with one of the largest mining companies in the world. Today I work 5000 feet underground with 15 other men on my crew, most of which are my dad’s age, and every one of them treat me like their own son. I’ve learned a lot from being diagnosed at such a young age. I grew up fast, not because I wanted to, but because I had to. While most kids my age knew every Ninja Turtle by name, I knew my list of medications by name and dosage. I learned the importance of listening to my body. I have a very high pain tolerance like most people who have a chronic illness, so when I have pain, I know something is up and I better go get checked out. I’ve learned to express myself to others, choose to tell who I want about my disease. When I was young, I always thought that people would look at me differently, but 9 times out of 10, when I mention that I have Crohn’s Disease, people will tell me about how they know someone that is living with it or they’ve heard about it. The odd time, they’ll say they never heard of it, so it gives me the opportunity to educate them about this disease. I have also met some really awesome people throughout the years, some of which I stay in contact with to this day. I’ve shared hospital rooms with other kids when I was younger and their moms have treated me like their own child when my parents couldn’t always be around. I’ve shared hospital rooms with some elderly who’ve told me stories of days gone by and of a time when Crohn’s was very uncommon. I had the opportunity once to share a room with a pastor who told me to always keep faith because God will never throw anything my way that I cannot handle. I’ve met some really great nurses ,who were new to the practice 20 years ago and have been great friends ever since. They learned about Crohn’s at the same pace that I did … and sometimes I even taught them a thing or two about the disease. Who else can say that they’ve invited and had their homecare nurse attend their wedding? I can!!! I felt compelled to tell my story because this disease is affecting so many young lives and its numbers are growing annually. If my story can be helpful to one person who is going through what I’ve been through, then I’ll have done my part in battling Crohn’s Disease. Greg - what an inspiring and moving account of your battle against Crohn's. Our daughter was diagnosed at 12, and had ostomy surgery at 19 - coincidentally, she was also diagnosed as having colic when she was an infant - did she EVER howl! Be well, and may you and your family go from strength to strength.